On February 7, 2014, the XXII Olympic Games opened in Sochi, Russia. Located on the shores of the Black Sea, not far from the southernmost point in Russia, Sochi is a summer resort town with a warm, humid subtropical climate. But the cold alpine climate of the Caucasus Mountains lies just a short distance inland. In the winter, the mountains offer steep slopes for snow sports and a venue for the Olympic games. 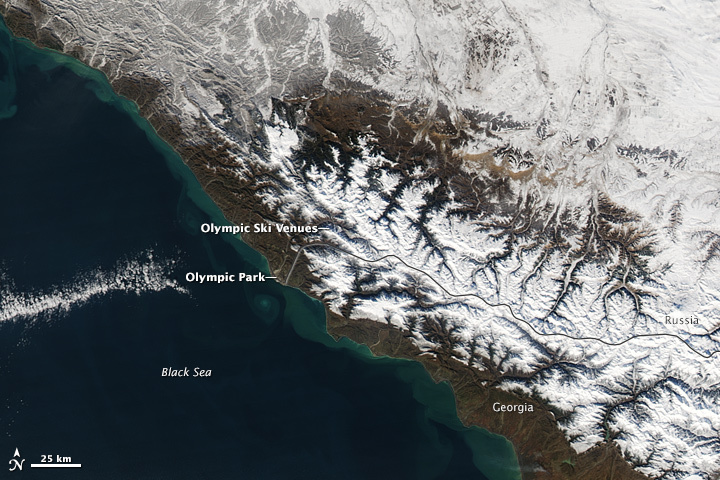 This image, taken on February 3, 2014, by the Moderate Resolution Imaging Spectroradiometer (MODIS) on NASA’s Aqua satellite, provides context for the area around Sochi. The Caucasus Mountains form the border between Europe and Asia, spanning the gap between the Black Sea and the Caspian Sea. They also form the boundary between cold, dry air from Asia and humid air from the Mediterranean. Flowing in from the south and west, the humid ocean air hits the Caucasus and gets pushed up. The rising air cools, resulting in heavy snowfall when temperatures are cool enough. Because of this pattern, snowfall tends to be heaviest in the southern and western Caucasus. 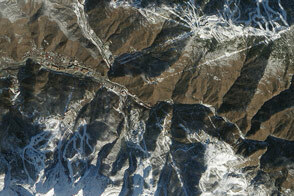 Rosa Khutor, the new ski resort that is the venue for mountain events at these Olympics, is built in one such region. Rosa Khutor is just 40 kilometers (25 miles) from Sochi and its subtropical warmth. Leading up to the games, some critics voiced concerns that Rosa Khutor would not have enough snow for competition. In February 2013, it was warm and raining at the resort, forcing several World Cup events to be cancelled. Spurred by these fears, the resort stockpiled 450,000 cubic meters (16 million cubic feet) of snow from last year and installed hundreds of snow-making machines to ensure the slopes would be snow-covered. Nature helped the Olympic hosts in 2014 with cold weather and some natural snow in the weeks prior to the games. 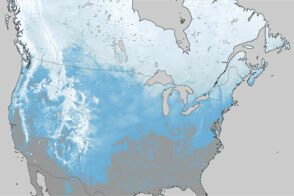 This map shows the extent of snow in the region on February 3, 2014. 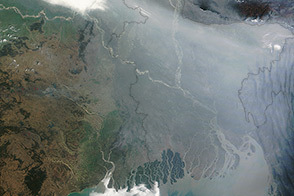 The map was made with data from the Moderate Resolution Imaging Spectroradiometer (MODIS) on NASA’s Terra satellite and matches the natural color image. 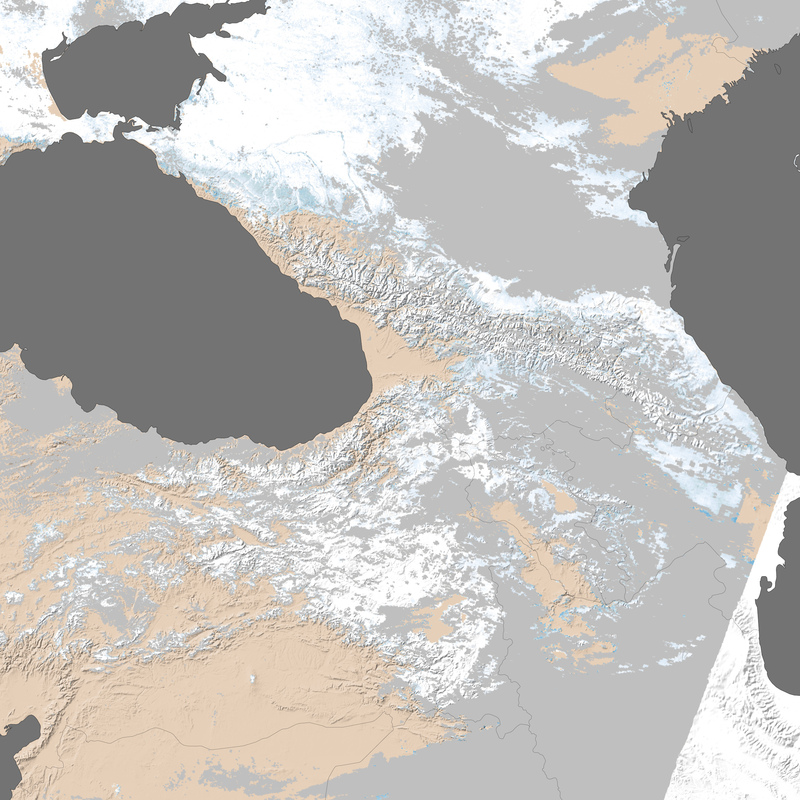 Unlike the natural color image, the snow map differentiates between snow and cloud, and between land that is entirely covered in snow, and land where snow cover is patchy. Krasnaya Polyana, the town at the base of mountain where Rosa Khutor is located, has little to no snow, but the nearby slopes appear to be mostly snow covered. Sochi is snow free. 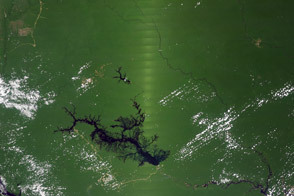 NASA Earth Observatory images by Jesse Allen, using data provided by George Riggs and Dorothy Hall (NASA/GSFC). Caption by Holli Riebeek. While Sochi itself appears to be dry, the mountain slopes are ready for the games. CNBC (2013, December 19) Winter Olympics in the subtropics: Just add snow. Accessed February 7, 2014. 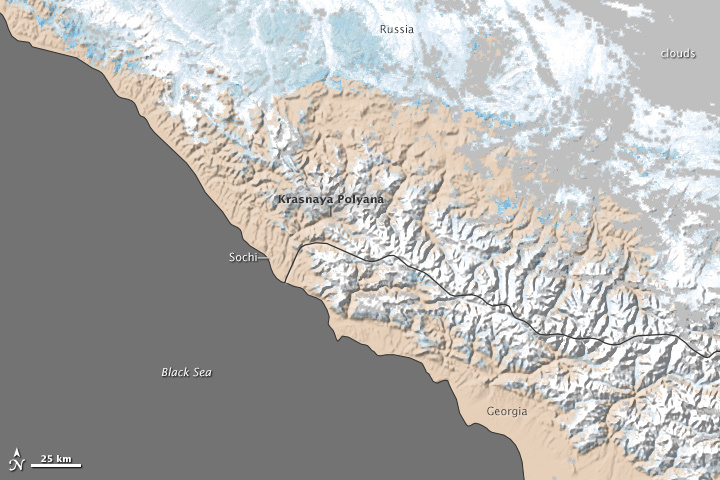 Geographic Bureau Climate in the Caucasus. Accessed February 7, 2014. 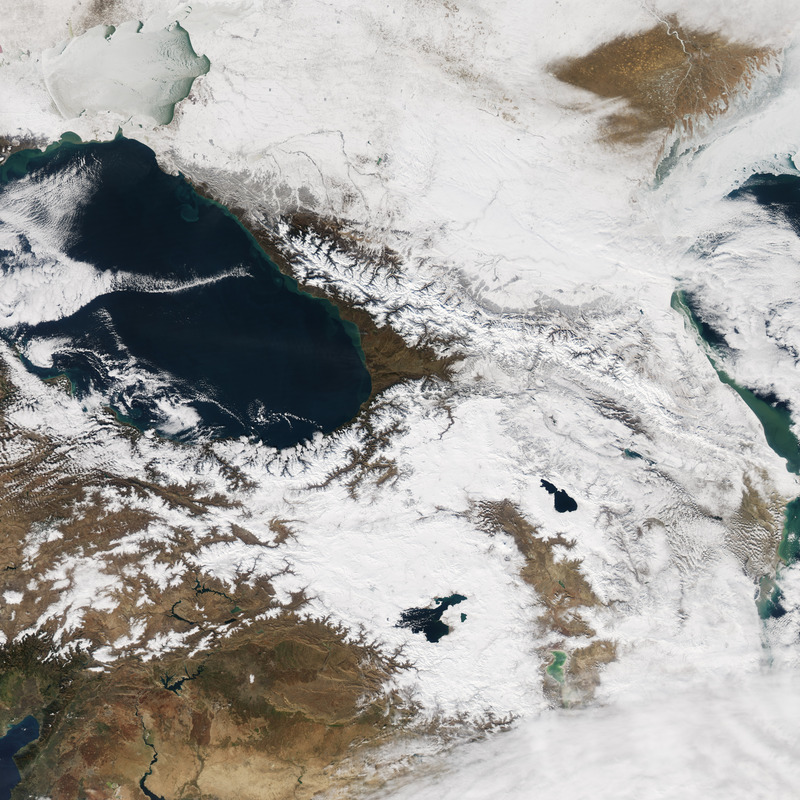 Grid Arendal (2012, February 21) Climate zones of the Caucasus ecoregion. Accessed February 7, 2014. 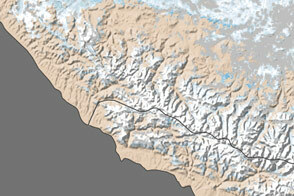 Grid Arendal (2012, February 21) The Causasus ecoregion, topographic map. Accessed February 7, 2014. National Public Radio (2014, February 5) One prediction of Sochi doom that hasn’t happened. Accessed February 7, 2014. The New York Times (2014, February 3) An Olympian snow endeavor in Sochi. Accessed February 7, 2014. RT (2014, January 4) Snowy Sochi Olympics: 16,000,000 cubic feet of snow stored for games. Accessed February 7, 2014. Springer Reference Caucasus Mountains. Accessed February 7, 2014. 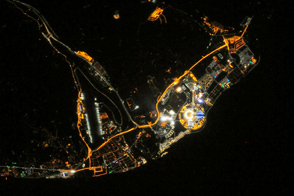 The Verge (2014, February 4) Freezing Sochi: How Russia turned a subtropical beach into a Winter Olympics wonderland. Accessed February 7, 2014. World Wildlife Federation (2008, July) Climate change in southern Caucasus: Impacts on nature, people and society. Accessed February 7, 2014. 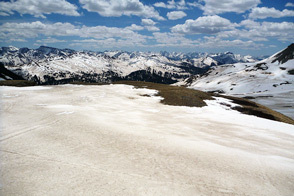 Unusually Low Snow Cover in the U.S.